Hagi city, Yamaguchi Prefecture, is the home town fo Kiku Totsuka, founder of Totsuka Embroidery. This place is special to me as I was evacuated there during the war. Choshu, the feudal name of Yamaguchi Prefecture, has a feudalistic image, having given rise to many spirited activists and politicians during the time of the late Edo era and Meiji Restorarion. However, there is another facet to the area, that of strong women. While the men were away, the women built a strong fortress to protect their homeland. I created this work by the request of the city of Hagi. 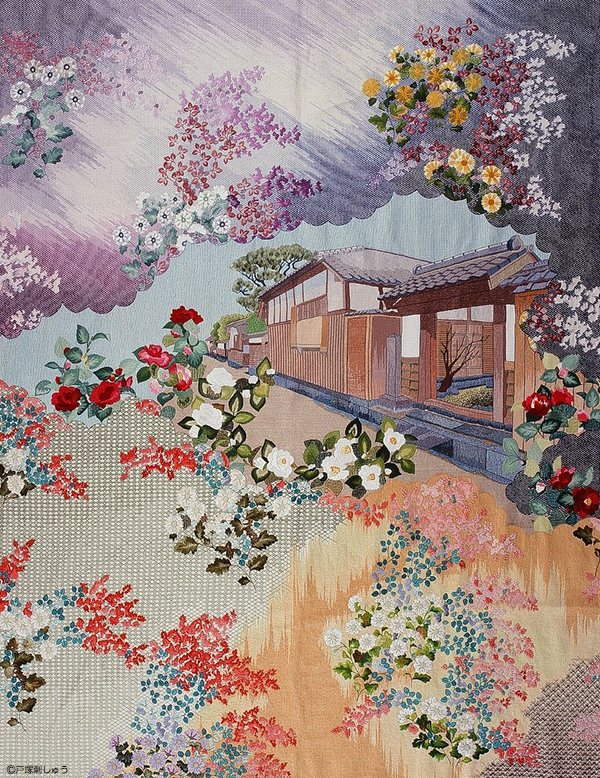 I incorporated noted places and scenes, and symbolized the drama of the dawning of a new era with a morning glow, and represented with stout stitching the strong but kind hearts of Choshu women. The year this work was completed was the same year the well-known Xavier Church was destroyed by fire. I will always remember that at every “My Hometown, Yamaguchi” exhibition that our works were displayed at, we collected donations for the rebuilding of the church.